Editing someone’s story, memoirs or work of fiction is not a solitary endeavor. It involves both writer and editor; advice offered and sometimes accepted, sometimes rejected; mutual respect; and ultimately, the production of a book that matches the writer’s vision. When Goshen resident Helmut Voellmann first gave me his manuscript to read, it seemed I was in for a daunting task. He handed me reams of yellow legal paper, each page filled with words written in small, tight handwriting. 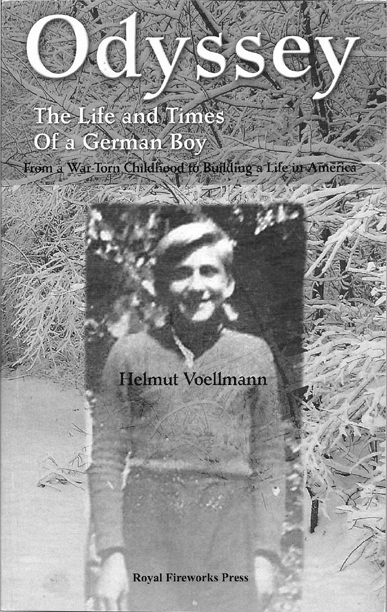 It was the story of his childhood, and it quickly became evident that Helmut has a wonderful writer’s voice – and a riveting story to tell. For 13-year-old Helmut, who grew up in East Prussia, Germany, the final weeks of World War II were fraught with terror and privation. With his mother and six of his brothers and sisters, the family fled home by foot in the dead of winter. They were heading northwest toward the Baltic Sea 250 miles away to escape the Russian soldiers, who were killing German civilians in their path as they made their way toward Berlin. Meanwhile, Helmut and his brother Siegfried had to escape their own German army officers, who wanted to put guns in their young hands to fight off the Russians to the east and the approaching Allies in the west. Escape to Denmark was the family’s only hope. And that is just the beginning of this extraordinary tale of a young man who grew up in a world of bloodshed, refugee camps and shattered lives but who would eventually rebuild a life for himself in America. Together, Helmut and I made decisions about how this story was to be edited, laid out and turned into a book that his family, his friends and even those who don’t know him have come to cherish. Many times I have told bits and pieces of my life stories to my sons and my grandchildren. Each time, they sat and listened and they asked questions. They were amazed that I could remember so far back, to when I was five years old. After they begged me time after time, I said I would try. I am well past seventy years old now and am very happy, too. Perhaps now is the time to tell my story in writing on paper. That is what this book is – a collection of the stories I have told my sons and grandchildren about my life over the years. I was born in the county of Wehlau in the small town of Sechshuben in the German province of East Prussia on February 12, 1932. I know, children, that you were taught in school that East Prussia is a part of Russia and Poland now, but it wasn’t that way when I was born, and a thousand years before that. It was only after Germany lost the Second World War in 1945 that East Prussia was taken and split in two, half to Russia and the rest to Poland. But before 1945, East Prussia was a province of Germany with Koenigsberg as the capital. It was one of the most beautiful parts of Germany. It was in size like the state of Connecticut, mostly flat with rolling hills with a lot of big forests with abundant wildlife, including elk, bears and deer. Some areas were crystal clear lakes with lots of fish, ducks, geese and frogs. In larger cities, there were some factories and mills. In cities to the north, near the Baltic Sea, were ports for building ships, big and small, with a lot of fishing boats going in and out. Not far from Koenigsberg are the world’s biggest amber mines and beautiful beaches with white sand as far as you can see. Mostly, though, East Prussia had small towns with farmers. They farmed wheat, rye, potatoes and many other vegetables. Most of the work was done with horses, but some larger farms had tractors. Then there were the gutshoefe – big ranches with a thousand or two acres. They did farming, too, but they also had big herds of cows and horses. That is where I lived for the first 13 years of my life, until Germany lost the war and the Russian army invaded East Prussia and marched toward us. It was the end of my childhood when the Russians came, and it was the start of a 250-mile escape to safety – a terrifying walk through the winter cold with only the clothes we had on, a pot, some spoons, and some newspaper for use as toilet paper. We walked by the thousands toward the Baltic Sea. Not everyone would make it. But before I tell you about that long, cold walk, children, I must go back to the start, to the beginning of my life in East Prussia. Here are the stories of my life in writing, as you have been asking me to do.